Hold the front page! News alert! There is a new Tim Tam in town – and if that wasn’t enough excitement, there’s also a new packaging format! Oh my goodness, I can barely contain myself. After months of boredom in the biscuit department (that led me to start looking at cheesy biscuits) this is exceptionally exciting. Well, for me at least. Let’s start with the new packaging. 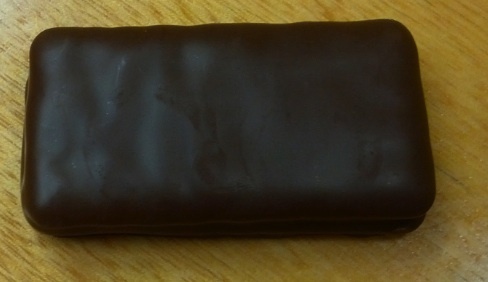 Arnott’s have taken it upon themselves to create a new ‘treat pack’ size, containing five Tim Tams. This seems to represent part of their continuing drive to break into the snack market – you will remember this innovation from a few months ago, which doesn’t seem to have been a great success, given that it is now rarely sighted in supermarket aisles. I think this new idea could be a winner; small enough to grab as a snack, probably thinking you will share the biscuits with someone, but few enough in the pack that in reality you’ll just scoff the lot yourself. Apparently the launch of this new size has been supported by a bus roaming around Australia handing then out. Unfortunately it doesn’t appear to have stopped in my street yet, but I’m hopeful that I’m on their agenda. And now to the real news – the new flavour. It seems the Choc Orange flavour is available exclusively in this new size, so you can’t buy a standard pack of them. Further research shows that this is not really a new flavour; more of a revival of an older model. 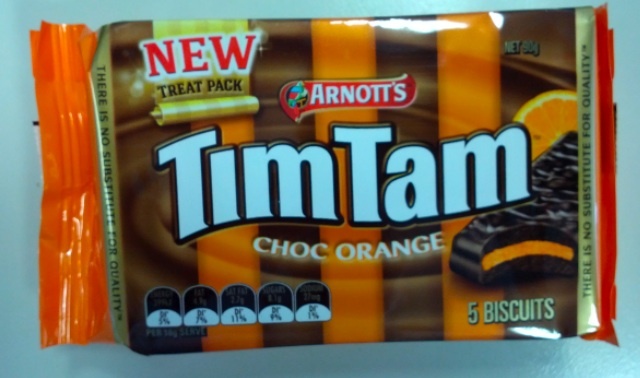 Prior to 2006 you could buy Choc Orange Tim Tams in regular packs, but they then vanished off the shelves. Whether these are exactly the same recipe as the ones sold nearly ten years ago I can’t be sure, but I suspect they could be. I wonder why they were withdrawn, and what makes Arnott’s feel now is the time to bring them back? So many questions! So what do they taste like? Well, they are made with dark chocolate, which is a promising start, and flavoured with real orange oil. And they are quite good; dark chocolate and orange is a classic combo, and these do capture that kind of 1980’s retro feel. However, if I have one complaint it is that they capture it a bit too well; they certainly take you back to a land of restaurant sweet trolleys and frozen gateaux but they also capture a bit too much of that 80s brashness. The orange creme is a bit sweet and full on and rather overpowers the smooth chocolate. Still, definitely worth a go for the novelty value. I’m going to give these a six out of ten. I finally got around to fixing the drivetrain on my fixie. I spend a few weeks ummming and ahhhing about buying the bits online and doing it myself – I even went so far as to put them all into a shopping basket on Wiggle, but never actually pressed ‘purchase’. The main reason was I was worried I wouldn’t be able to get the lockring off the the fixed sprocket. I do have the right tool, but it’s a rather puny, cheapo affair that I suspected would not be up to the task. I did then consider also buying a decent tool to do it with (which would still have worked out cheaper than the LBS), and perhaps a new lockring (in case I trashed the old one getting it off), but by this time it was all getting too hard, so I decided to go to the LBS instead. Oh, and I am also too lazy to do these things myself. I took the bike in in November, but for various reasons it took until the end of January to get the work done. Now, I don’t want to slag off my LBS here, as they re really nice guys who are generous with their time and do a good job for me. But, well, sometimes I do thing small stores could be a little more organised. What with my order getting lost in some diary transfer, confusion about what size chainwheel I needed and a discussion about whether it was a freewheel or fixed gear I wanted it all took a long time to get sorted out, what with wrong parts having to be sent back and so on. Customer service is about more than just great service whilst you’re in the shop; it also extends to getting the details right first time and not losing track of orders. Oh well, sermon over. I suppose it meant I eked a few more months out of a pretty-much-dead drivetrain. Whilst the fixie was in surgery, I of course rode the Radish. And in doing so realised it too needed some TLC; the front brake pads were worn down and the gears were not changing smoothly. So I booked it in for a service. It turned out that the drivetrain on that was ‘end-of-life’ too; the technician put the chain wear gauge on it and declared ‘it’s well over 2% stretched – that chain is never going to change gears smoothly. You need a new chain and cluster.’. Funny; it never occurred to me that it might be worn out – even though the bike is four or five years old and it’s still on the original chain. So this all had to be arranged too; thankfully with no ordering stuff-ups so it was all dealt with very quickly and efficiently. So now I had two new drivetrains, with both bikes feeling silky smooth and lovely to pedal. The fixie did indeed feel teriffic – all the play in the drivetrain was gone, as was the grinding, rattling sound of the chain. Just smooth, oiled whirring. But the Radish didn’t seem so good; something as still rattling and grinding around. I gave it a quick once over, and discovered the culprit – the bearings in the pedal were toast, and the right pedal was wobbling and grinding around like the ones on an old kids trike. Back to the LBS for a set of new pedals, and things seemed better again. But then not. The drivetrain still felt a bit grindy, and the gears were jumping. I was riding along unhappily, thinking that I would have to take it back to the LBS again, when I remembered something. I pulled up, and had a peek under the pannier. A-ha! Of course! The rear skewer had worked loose again! No wonder it was all a bit odd with the back wheel wobbling around all over the place. The LBS guys wouldn’t have know that it tends to do this, and that it needs to be super tight. So I tightened it up, and continued on my ride (and props to the fellow cyclist who stopped to ask if I was OK at 10.30pm last night when I was sorting it out – much appreciated). Bliss. Smooth, oiled whirring and slick gear changes. Fellow cyclists unite – you have nothing to lube but your chains! I received a Kindle for Christmas last year, I think after Mrs Chillikebab got fed up with me borrowing hers and relegating her to the ignominy of a real, actual paper book. E-readers are the go, people. Ditch that paper – so twentieth century. E-books are just so much more convenient – (and so much cheaper). That said, there is one thing I miss about real books – and that’s the front cover. Being somewhat visual in nature, I rememberer books, titles and authors by the cover artwork, and I find on the Kindle I struggle to recall the title or the author of the books I have read. There’s also a slightly jarring sensation when you start reading, as the first thing you are confronted with is the first age of text. Opening a new book after looking at the cover, then flicking through the first few pages of bits and bobs to find the start of the actual book represents a few moments of pleasant anticipation which are missing with an e-book. This small thing is outweighed but the huge advantages of the electronic format, but perhaps publishers could include some sort of digital cover and title page? Oh dear, I’m starting to sound like one of those people lamenting the demise of vinyl because of the artwork. So what have I been reading on my Kindle? Well, the first book I read was Katherine Boo’s extraordinary account of life in a Mumbai slum. It is not a work of fiction, but it is more than a simple documentary. The characters leap off the page, vividly portrayed, and the prose rattles along like a novel – this is a book that’s hard to put down. Yet it is disturbing. Boo is neither sympathetic nor judgemental in her depiction, but reveals a set of desperate lives, lived in a place where it is both necessary to reply on and trample on your neighbours just to survive. To read this book is to get a glimpse of poverty; of the dreadful cheapness of human life and the unobtainability of even the smallest part of the world’s wealth that drives the very poor to exploit those even weaker and poverty-struck than themselves. This is a book I highly recommend; it will stay with you for days and weeks after you finish it, and raise uncomfortable questions in your mind about equality and equity. As I put my shiny new Kindle down after reading it I can’t help reflecting that its quite modest cost represents probably the annual family income of some of the characters depicted. Real people, with real names, living in that place even as you read this, scratching a living out of scrabbling for bottletops in dustbins and selling their bodies for a few cents. 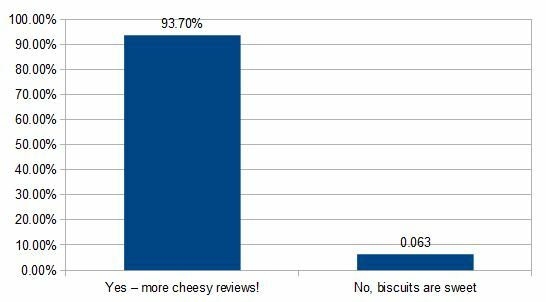 Some time ago, I posed the question ‘Should I write more savoury biscuit reviews?’. Well, the results have been flooding in at a rate approaching one a week, such that I now have a statistically valid sample to judge the issue from. And so <drumroll>, I can reveal that yes, you pretty much overwhelmingly voted for more cheesy reviews. This is excellent news, as it gives me a rich new vein to mine in my search for superlative adjectives and mixed metaphors. So what’s up today? Well, today it is the ‘Country Cheese’. 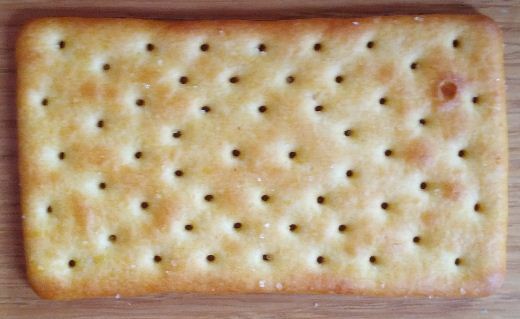 Like many of Arnott’s savoury biscuits, they are packaged up in a smart dark-blue box. Why only cheesy biscuits get this treatment, I don’t know – there are plenty of fragile sweet biscuits that would benefit from this packaging. The other intriguing thing about the savoury range is that the packs feature actual photography, which apparently requires the ‘serving suggestion’ disclaimer. Do people really believe that the box will also house a wooden board, a tiny bit of spring onion and some blurry cheddar? And are people who think that capable of reading the words ‘serving suggestion’? Or is it that this is actually how Arnott’s recommend you serve them, and across the land people are propping them up on little bits of onion in an oh-so-sophisticated way? All very strange. One thing I will say about the pack photography though; that is a very small wooden board and a tiny piece of onion. And that bit of cheese in the background? Just a fragment that broke away from the main block. You see, the photo looks to me as if these biscuits are going to be quite large, perhaps packed flat with a plastic tray insert. But in reality they are packed in conventional end-on manner, and measure only 81mm by 44mm. 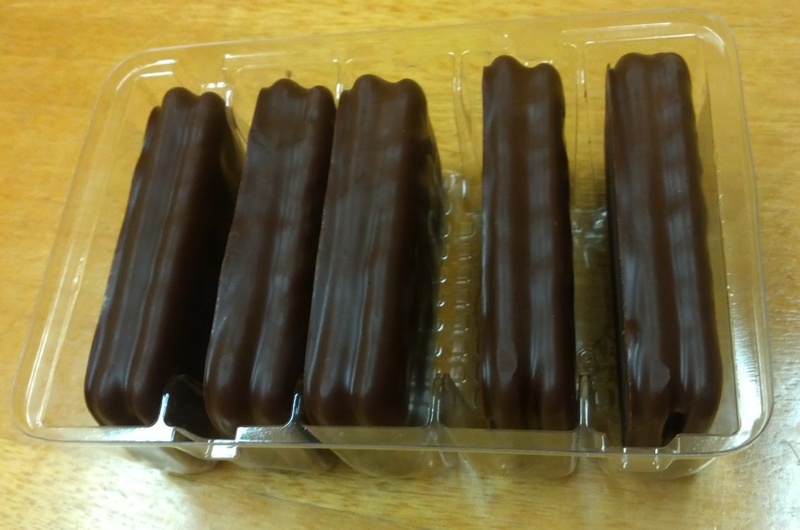 The one on the box measures 73mm by 54mm, so either there is some very weird parallax error going on, or the ‘serving suggestion’ extends to carefully shaving the end of each biscuit to make them shorter, prior to giving your guests magnifying glasses that make everything look ten percent bigger. Enough of all of that – how to they taste? Well, they are light and crunchy with a pleasing crumbly texture. They have a certain cheese flavour, although it is fairly muted, and perhaps equally strongly present are notes of malt and vegemite. They are quite pleasant to eat on their own, but strangely get a bit sickly after a few of them. Funnily enough they don’t go very well with cheese. I tried them with all sorts of things, from the cheddar suggested on the box through to a soft rind Brie and even a robust Stilton, but nothing really worked that well – the flavours of the biscuit just fight too hard against the cheese. Such is the nature of country folk, so I suppose the name should give ample warning.